Attah-Krah (left) speaking at the meeting. On 7 December, Corporate Farmers International (CFI), IITA, and the Nigerian Stock Exchange (NSE) launched the Nigeria Stock Brokers Agribusiness Group (NSBAG). 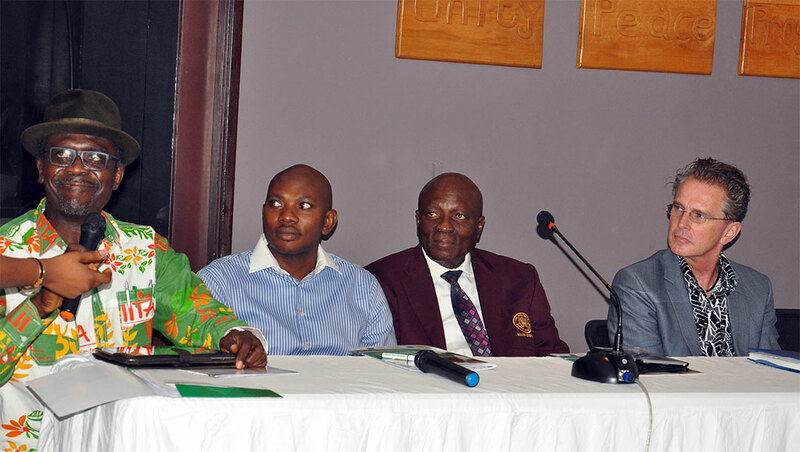 The official launch was held in Lagos at the IITA premises. CFI and NSE are IITA partners that have helped us with promoting the IITA50 celebrations. Dr Kwesi Atta-Krah, Director, Country Alignment and System Integration, IITA, said that it is time to transform agriculture from a mere culture to a business since as a culture agriculture is no longer productive. “Agriculture has the potential for spurring economic growth, job creation, and revenue generation. There is need to create an avenue to engage the private sector into agriculture for it to succeed. It is, therefore, important for everybody to be responsible to ensure that this launch does not end here,’’ he said. Atta-Krah said it is important for everyone to work together for the goals of the initiative to succeed. Mr Babatunde Sobamowo, Chairman of NSBAG, said that the essence of the group is to ensure a growth rate in agriculture contributions to Nigeria’s Gross Domestic Product (GDP). Sobamowo confirms that it is time to raise incomes and reduce the poverty level among others via agriculture because farmers are losing money due to the fact that there is no platform to place agricultural products. “It is time to leverage on the opportunities presented by governments at various levels through some laudable initiatives. This initiative will create a lot of business opportunities to be able to access cheap and long-term funds at a very low interest rate,” he said. Mr Solomon Olakanmi, Secretary of NSBAG, said that it is time to tap into the potentials in making agriculture a business through various value chains. Olakanmi said that agriculture will thrive with the availability of financial resources and the NSE would be playing an intermediary role between investors and producers. “This will generate substantial income, jobs, and wealth for the various stakeholders involved. All the sections in agriculture like production, processing, and provision of necessary inputs, marketing, trading, and funding will be adequately addressed,’’ he said. The National Coordinator of CFI, Prince Ade Ajayi, said that the future of agribusiness would change with the emergence of NSBAG. Akin Alabi, CFI Managing partner, said that this movement will create the public, private partnerships (PPP) that will bring investors to the IITA Business Incubation Platfrom and further develop the Nigerian agribusiness sector.